PingPlotter is a popular network monitoring tool that has helped countless organizations to troubleshoot their networks. PingPlotter takes information about your network performance and records it in a graphical format so you can analyze network performance. 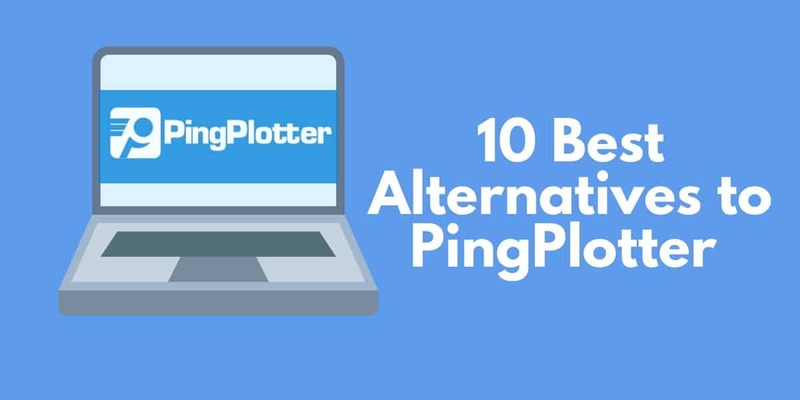 However, there are a number of limitations which is why we’ve created a list of the x best alternatives to ping plotter. 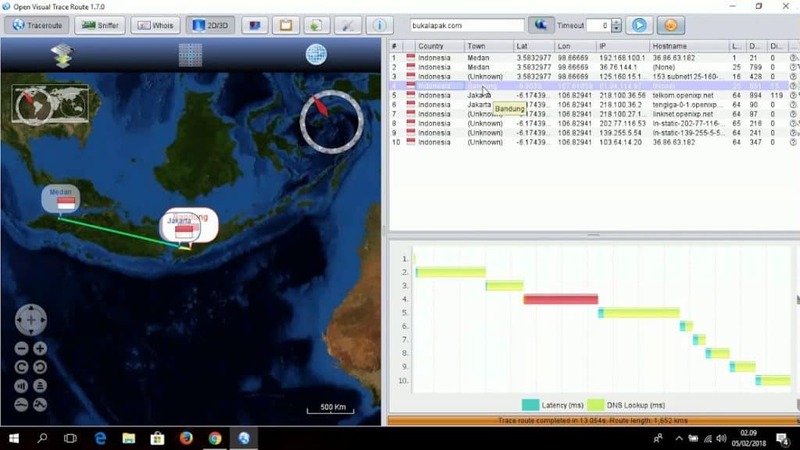 TraceRoute NG is SolarWind’s network path analysis solution and PingPlotter alternative for Windows. TraceRoute NG offers support for IPv4 and IPv6 and can detect path changes when they occur. Path changes are monitored on TCP and ICMP to ensure maximum visibility. Once live, TraceRoute NG can be used to identify details like IP addresses and hostnames. In addition, you can also monitor for performance issues like packet loss and latency. All of this is monitored through the simple user interface which provides a graphical display of network usage. Overall TraceRoute NG is a free alternative to PingPlotter, that provides everything you need to monitor network performance and troubleshoot for key issues. Though it is not as sophisticated as a tool like SolarWinds Network Performance Monitor, it provides all the basics necessary to monitor a network. You can download TraceRoute NG for free. Next up on this list we have PRTG Network Monitor. PRTG Network Monitor is a network monitoring tool that offers a diverse range of features beyond those provided by PingPlotter. With PRTG Network Monitor you can run ping scans and Traceroute with configurable sensors. For Traceroute monitoring there is a dedicated Traceroute Hop Count Sensor which is used to monitor the number of hops a probe sensor needs before reaching another device. With the Traceroute HopCount Sensor you can view the following metrics: Execution time and Number of Hops. In addition, there is a Ping sensor dedicated to measuring the availability of connected devices. With PRTG Network Monitor’sPing Sensor you can monitor the following metrics: Ping time, Minimum Ping time when using more than one Ping per interval, Maximum Ping time when using more than one Ping per interval and packet loss as a percentage. PRTG Network Monitor is one of the best PingPlotter alternatives on account of its modern user interface. The monitoring experience stands out amongst other similar tools in this list. There is a free version of PRTG Network Monitor which allows the monitoring of up to 100 sensors free of charge. If you require more then paid versions of PRTG 500 start at $1,600 (£1,206) for 500 sensors. There is also a 30-day free trial you can download below. 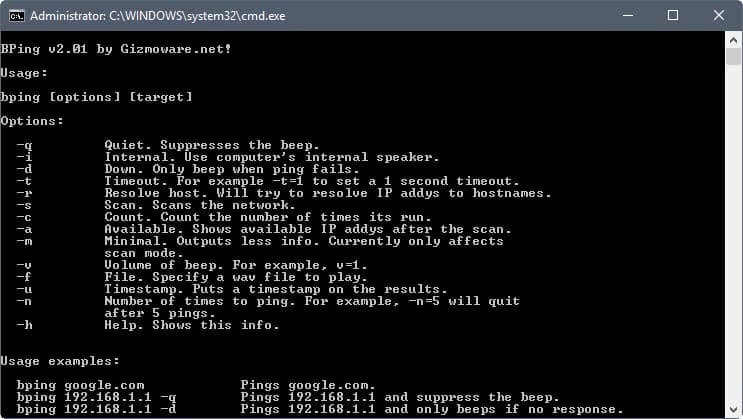 WinMTR is a Windows-based ping and Traceroute tool. To use WinMTR all you need to do is enter the hostname or destination IP address of two points you wish to monitor. The tool will then monitor the connection quality between the two points and relay the results to you for analysis. Once your ping scan is complete, you can view the results as an HTML or .txt file. You can then use this information to look for any issues that you might have missed. For instance, you can see how many hops there are between the two points to see if packet transfers are efficient or not. This tool is available in all 32- and 64-bit versions of Windows making it ideal for any network using that operating system. WinMTR is all-in-all a reliable alternative for those looking for network diagnostics monitoring within small networks. The main limitation is its lack of graphical features. WinMTR can be downloaded for free here. 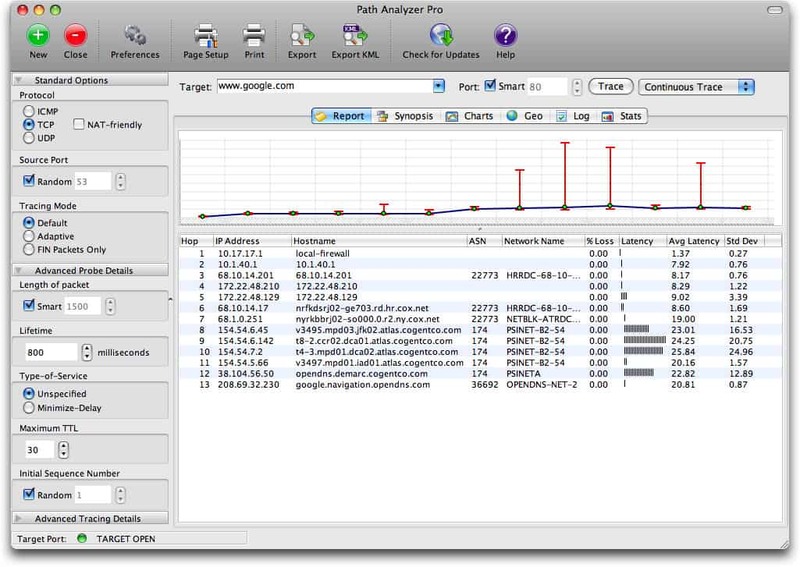 Path Analyzer Pro is a network monitoring tool that can run traceroute, DNS resolutions, whois resolutions and ASN/ISP resolutions. In other words, you can use this tool to find IP addresses, email addresses, network paths and monitor network availability. All of this information can be viewed further by creating reports. This tool is an ideal solution for users looking for a more visual experience, as you can create graphs that display problems like latency and jitter. Being able to use these graphs is extremely useful for keeping on top of events as they occur and making sure that you don’t miss anything important. Path Analyzer Pro is available on Mac OS and Windows (although the Windows version is limited to Windows XP, Vista and Windows 2003 Server. The price of Path Analyzer Pro starts at $29.95 (£22.59) for an individual personal license and $89.95 (£67.84) for a business user. There is also a limited free version that can be downloaded here. If you’re looking for an open-sourced Traceroute tool then you should look no further than Open Visual Traceroute. Open Visual Traceroute allows you to view a 3D map of the world to see how data is travelling from your computer to the server. You can also use 2D maps if your hardware can’t support the 3D map. Open Visual Traceroute has a packet sniffer as well. With the packet sniffer you can see what data is being sent through your network. The packet sniffing function is useful because it can help you see if there are any services that are hogging bandwidth or if any attackers have breached the network. There is also a Whois lookup feature so that you can find more information about specific domains. For smaller organizations that want a more visual Traceroute experience, Open Visual Traceroute is ideal. On Windows, Open Visual Traceroute is available for Windows XP, Vista, 7, 8 and 10. You can also use Open Visual Traceroute on OpenSUSE and Mac OS as well. You can download this tool for free using this link here. CountryTraceRoute is a fast-paced lightweight Traceroute application from Nirsoft. The GUI may not look as fancy as some other tools on this list but that doesn’t slow it down during live use. All you need to do is enter a URL into the search bar, press Go and you can view the number of hops, IP address, host name, country and average milliseconds of the connection length. Anyone looking for a basic Traceroute utility will be completely supported by CountryTraceRoute. However, if you want a more visual experience you should definitely choose an alternative tool. CountryTraceRoute is available from every version of Windows 2000, up to Windows 10. You can download CountryTraceRoute for free here. NetScanTools Basic is a barebones ping and Traceroute tool available for Windows. 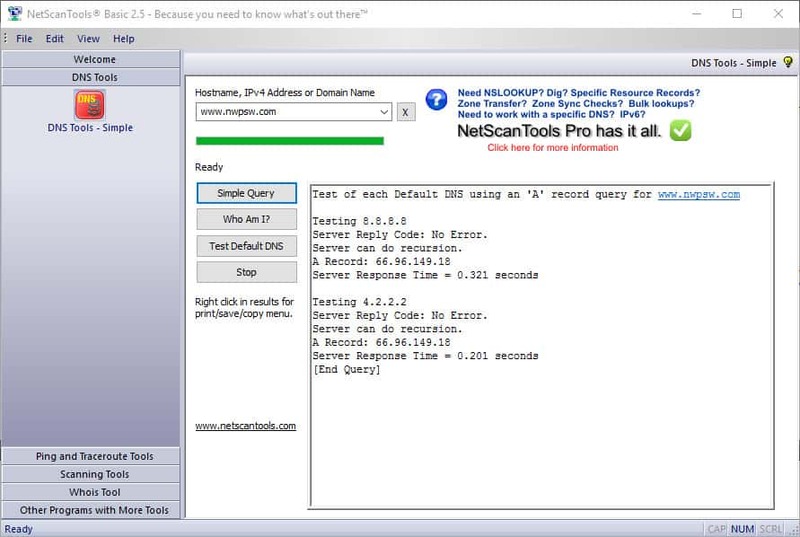 With NetScanTools Basic you can run ping scans, traceroute, whois lookups, and IP/hostname resolution. The user interface is incredibly simple to navigate with each tool listed on the left hand side so that it can be accessed. When you click on Ping and Traceroute tools you are asked to enter a Target Hostname or IPv4 Address before pressing Do Ping to run a ping scan. You are then shown a table of the results detailing Ping #, Responding IPv4, Time (ms), TTL and Status. You can then right-click on the results to print or save a copy. There is also a graphical ping tool included that displays a graph of ping scan results. You can configure what information will be shown by entering the Delay Between Pings, Response Timeout, and Max Hop Count. The graph then shows you Ping RTT and Missing Replies. Netscantools Basic is one of the most versatile alternatives to PingPlotter on this list. If you’d like to download NetScanTools Basic for Windows then you can do so for free through this link here. SmokePing is an open source ping and latency measurement tool that has proven popular amongst network administrators. SmokePing has live latency charts to tell you how the network is performing. Setting up this tool is incredibly easy and you can use it to schedule pings at certain time intervals so that your network is monitored when you want. When the system detects unusually high latency you are sent an alert. Alerts are triggered with thresholds so that you only receive notifications when you need to take action. However, if you want to monitor performance more closely there are lots of visualization options to support you. For example, you can generate graphs to view ping scans and the effect of performance issues like packet loss. SmokePing is an ideal choice for organizations looking for a free latency measurement tool on Linux and BSD. You can download SmokePing here. 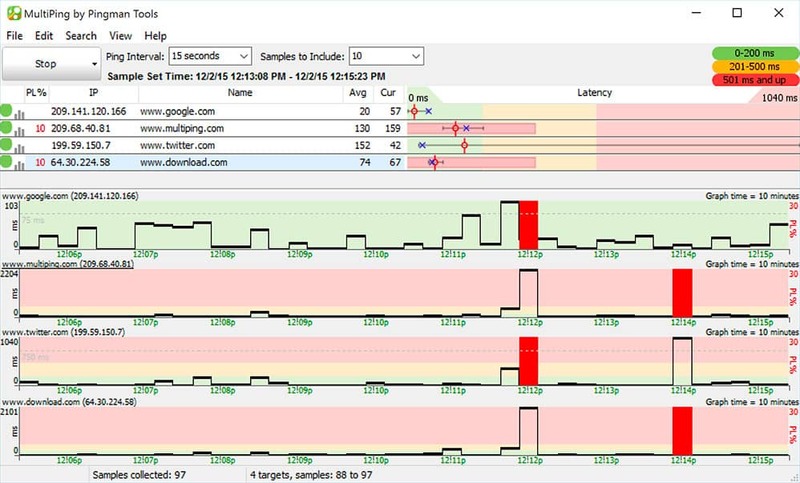 Multiping is a Windows-based ping monitor which offers a network discovery feature. You can scan a list of IPs and automatically add devices to your monitoring environment. Metrics you can monitor with MultiPing include packet loss percentage and latency (minimum, maximum, and average). The platform also has support for IPv4 and IPv6 so that you have all the information you need to monitor network performance. Your monitoring efforts are supported via an alert system that sends a notification to your email if a problem is identified. With Multiping you aren’t limited to monitoring real-time events. You can browse through the network’s performance history to see if there are any key trends that you might have missed. Multiping is also a good choice if you’re still using PingPlotter because of its integration options. You can purchase Multiping for a price of $39.99 (£30.16). This price purchases for you a year of free upgrades and the option to monitor unlimited targets. You can also download the Multiping trial for free on Windows through this link here. Finally we have Bping (beeping!) which is a Windows ping tool that lets out an auditory beep every time it gets a reply. You can also configure it to beep when it doesn’t receive a reply as well. You can choose custom wav files to play if you want to change the default sounds to something more familiar. Bping also checks your internet connection and highlights available IP addresses within a network. While the system is a little rudimentary the auditory beeps is excellent for keeping you in the loop over changes on your network. Bping can be downloaded for free on Windows here. No matter what Traceroute tool you use, there are plenty of alternatives to PingPlotter. Old school Traceroute tools like TraceRoute NG and WinMTR provide you with the essentials needed to monitor your network. If you need a tool that is more versatile and modern, then a tool like PRTG Network Monitor would be a better choice. Likewise for enterprises that require more visualization, a tool like Open Visual Traceroute would be a good fit. No two environments are the same, so if one tool doesn’t work for your environment, try another. The biggest consideration is whether you want a simple tool or one that incorporates visualization.